Preheat oven to 400 degrees. Line a large baking sheet with foil and lightly grease with cooking spray. 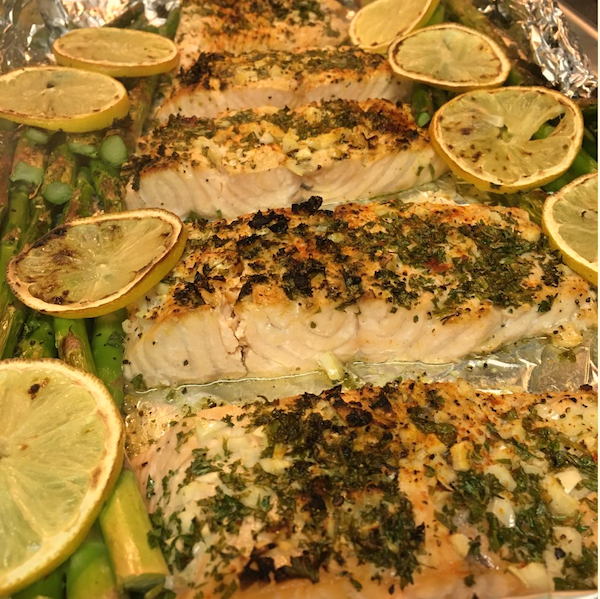 Arrange salmon in the center of the pan and arrange asparagus around the sides of the pan. Arrange lemon slices under the edges of the salmon. Season salmon and asparagus with salt and pepper. In a small sauce pan, melt butter over medium high heat. Once melted stir in garlic and Italian seasoning. Pour mixture over salmon and asparagus. Bake for 10 minutes, then change oven to broil and cook another 5-7 minutes. Top with fresh herbs if desired and serve.